The second double gameweek bonanza is also the penultimate weekend of the 2017/18 Premier League season. We expect FPL managers to be in one of three situations by this time of the season – 1) defending a lead at the top of the table 2) part of the chasing part 3) fallen way behind. Being in different situations warrant different strategies this GW. There are of course a myriad of ways to play this but we recommend that 1) if you are defending a lead, go for safe picks an avoid differentials. If you are 2) chasing the leader, the reverse must be true – time to throw in some risky picks into the pot and take a good shot at it. If you fall into category 3), why not take an early break, hit the beach and freshen up for next season. This week, we offer a set of safe picks and a set of differential picks. Antonio Valencia (MNU/ DF / 6.9m) – pricey choice but like de Gea, Valencia looks set to play the remaining fixtures and United look good for at least 2 clean sheets. Aymeric Laporte (MCI / DF / 5.1m) – City can technically play anyone at this stage but January signing Laporte is a good bet to play their remaining fixtures as Pep evaluates his suitability for next term. Macros Alonso (CHE / DF / 7.1m) – safe picks come with a price and Alonso is a good pick. Coming back from suspension, Chelsea has three winnable games. Gabriel Jesus (MCI / FW / 10.4m) – City’s only recognised striker will play in all their remaining games. Kyle Naughton (SWA / DF / 4.6m) – Naughton is a good DEF to have if you want to save the cash for attacking players. Aaron Cresswell (WHU / DF / 4.9m) – West Ham still the points so Cresswell should start in their remaining games. Also take some set-pieces. Marko Arnautovic (WHU / MF / 7.0m) – The Hammers need strong performances from the Austrian to stay up. Dusan Tadic (SOU / MF / 6.2m) – 3 goals in his last 2, can be the Saints’ talisman if they are to stay up. Aaron Mooy (HUD / MF / 5.2m) – Three nightmare fixtures for Huddersfield but Mooy is a cheap option to bench. 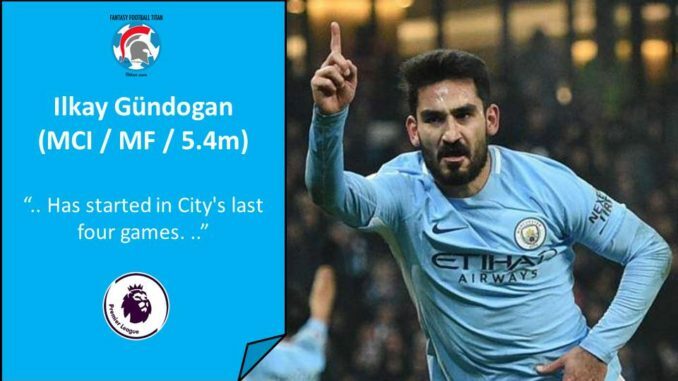 Ilkay Gündogan (MCI / MF / 5.4m) – Has started in City’s last four games and look set to continue as David Silva is said to be granted extended leave. Marcus Rashford (MNU / FW / 7.3m) – With Lukaku unfit and Martial seemingly out of the door, Rashford may play a starring role in the remaining three games. 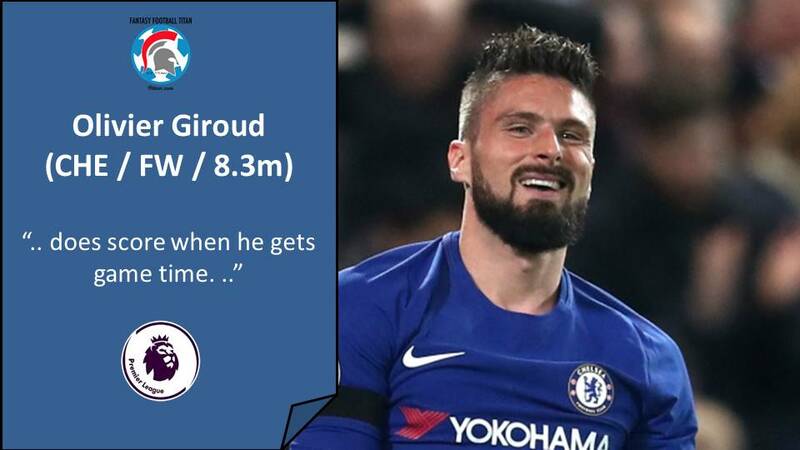 Olivier Giroud (CHE / FW / 8.3m) – Has started Chelsea’s last two and he does score when he gets game time.